Update: I think I've got this whole thing figured out now. However, the instructions have a warning that my site could be down for as much as 48 hours while some sort of magic internetty turnover happens, so I'm going to wait until the weekend to try this. That way if I break the internet, I won't screw with too many people's work week. 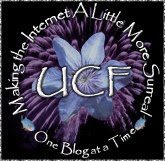 I can simply change the address of the blog to polybloggimous.blogspot.com by following this set of instructions. That's definitely better than where we are now (getting rid of my lame musings, etc. 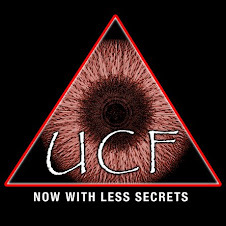 ), but it seems just a little bit clunky. Blogger offers me the option of buying a domain. But I've already bought my domain. This doesn't seem to be what I want. But over there on the right side of the screen, it says "Already own a domain? Switch to Advanced Settings." OK, lets see what they have to say over there. So, does anyone know if I plug Polybloggimous.com into that little window if that will change the url and continue being free stuff here? Or would I have to set up hosting somewhere? Like I said above, I'm not ready to do anything like that yet. So who knows what all of this means? Well, if they don't have your credit card number, go ahead and try it! It can't hurt! Brad Hill's Blogging For Dummies talks about "tak[ing] advantage of Blogger's free FTP service, which enables Webmasters to use Blogger templates and tools while keeping the blog on their own domain" (p. 88). So I think the answer is "yes"? Maybe? By purchasing a book called Blogging For Dummies, I think I demonstrated just how much I know about the subject. But I hope that possibly helps. I'll have to reread the directions when I try it this weekend, but if seems like a three step process. 2. Go over to GoDaddy and enable some arcane connection to google/blogspot. 3. Swing a live chicken around my head seven times while facing magnetic north and chanting "good-googely-moogely". Make sure you swing the chicken counterclockwise... the other direction will get you air artillery support in Kazakhstan. Whew, that coulda been a close one. Thanks for the heads up. This technology stuff just boggles. I just don't think I'm gonna go that route for the moment. If I wanted to pay for the .org one, I think that would be better but I don't want to pay for it. And the .com one, I don't think is as good as blogger. Hey Nathan, I'm going to pass along some further help-deskish info that you probably already know. Forgive me if I'm being overly basic. Your website is a set of pages & a database that lives in a folder on a server at Blogger. Blogger has set up the domain name nathansmusings.blogspot.com as a pointer to your folder location. A personally-owned domain name, like polybloggimous.com, is simply another pointer to the folder location of that same set of pages. I'm assuming you set up domain name forwarding on your godaddy account administration, pointing your new polybloggimous.com address to nathansmusings.blogspot.com. What's wrong here is that Blogger, after that first forward, is preferring to display your original domain name nathansmusings.blogspot.com instead of your custom domain name, because that's what Blogger thinks your name is. Blogger's directions for setting up your domain name are different than the approach I would normally have taken. They have really good detailed instructions for setup within godaddy that should help. If you go through the somewhat complex process they describe, your domain name should work for all pages. If you buy your own web hosting space, you're simply setting up a different empty folder on another web server somewhere. You can set up your domain name to point to that location, it's somewhat easier if you buy hosting space from the same provider as you went to for your domain name. The advantage is that there is no pre-existing domain name – your name is the only one that applies to that site. If you set up your own web hosting and site, you do have to upload your entire site from scratch – whether it's static pages, or an instance of Wordpress, templates and content. There are ways to import your existing content so you're not starting from scratch. I hope my geeky ramblings help! I did find those instructions for doing the enabling thing on GoDaddy. The problem I was having with masking is that it masked absolutely everything. Right now, if you enter Polybloggimous.com, Go Daddy is forwarding it but not masking 'cause I turned off the masking. I think that fix through Advanced Settings if the way I want to go. I really don't feel like hosting somewhere else. Look, I've only recently passed the phase where my computer was just a really bright typewriter. I'm proud as hell that I figured out how to grab and post screenshots (first time for that, yay!) I'm just not ready to do any serious coding or paying for blogging. I've said it before, but until about a year ago, I though HTML was internet shorthand for "hatemail". You can teach an old dog new tricks but you have to feed them to me slowly. Nathan, Jeri has the right information, but she's giving you too much of it. You want to use Blogger's free service and you aren't interested in having your own web hosting service. Like she says, the first thing you have to do is point polybloggimous.com to ghs.google.com. This is according to the Blogger instructions she linked to. That is what GoDaddy does for you, and you should get that done as soon as possible. It takes up to 72 hours to propagate through all the DNS servers. 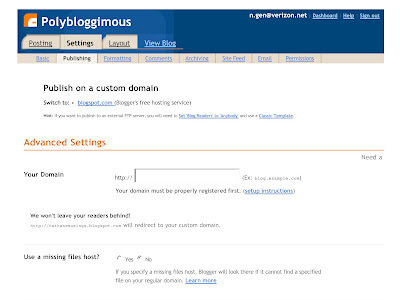 It won't affect your blog, it will only affect the use of polybloggimous.com. You will still be able to access your blog using nathansmusings.blogspot.com the whole time. After that's done, then you tell your blog what its address is. That's what the "switch to: Custom Domain" page does. That's how your blog knows where its data is, and what URLs to generate for permanent links and such. 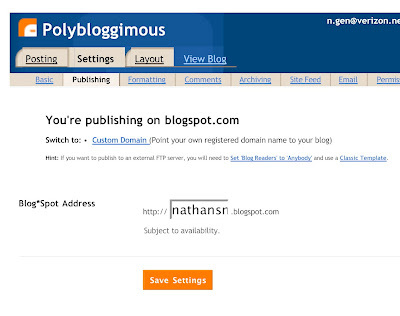 Once you switch to the polybloggimous.com domain, you should be all set. If someone tries to access through nathansmusings.blogspot.com after that, they are forwarded to ploybloggimous.com and everything works. 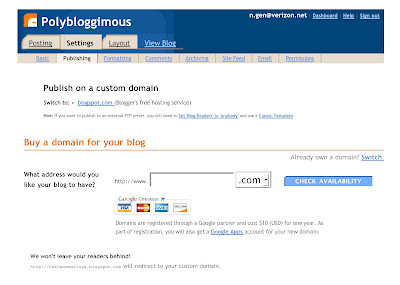 If you switch to the Custom Domain before polybloggimous.com points to the right address, that's when you break your blog. I totally get what you're saying, but I'm still too excited about having figured out how to create and post screenshots to do any other 'putery kind of stuff yet. Maybe later today. Nathan, that's probably for the best. You got to take this geek stuff in small doses. It's heady stuff.